Why do centipedes have so many legs? How on earth does a firefly’s bottom light up? These are a few of the hundreds of “whys and hows” that swirl through Maggie McNair’s mind. She’s a brave and courageous seven year old girl with her own style. She isn’t fond of taking baths, or brushing her hair. Getting dirty is much more exciting! Her ability to embrace fun is contagious. Playing outside and exploring every square inch of God’s amazing creation is the only thing on her mind. Maggie’s world encompasses her backyard and beyond. It’s filled with everything a kid could want: a treehouse, playhouse, zip line, a creek, great climbing trees, a fishing pond, and woods to explore. This is where Maggie meets her nine best friends, who happen to be bugs. Maggie’s bug friends are fascinated by her adventurous spirit, but they also have to keep a close eye on her because her inquisitive nature and impulsiveness can get her into trouble. Plus, her adversary, Ace the night crawler, is always trying to trick her into believing lies —and she can be easily influenced. She’s just too busy to remember all the rules. Her bug friends are instrumental in her spiritual growth, as each one represents a fruit of the Spirit. 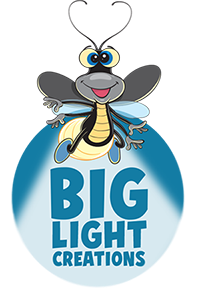 In short animated episodes, Maggie and her comical bug friends, like Stink Bug, who values honesty, peace (and a ripe odor); Firefly, who is always kind (and oh so cute); and Papsi, a stick bug who’s good, wise (and cranky), all tackle hard questions and moral dilemmas that children often face regarding God, faith, and just being a kid. With lightheartedness and a sense of humor, these topics are handled with sound biblical principles, without being “religious.” In Maggie’s World, character always counts and consequences become the teacher.